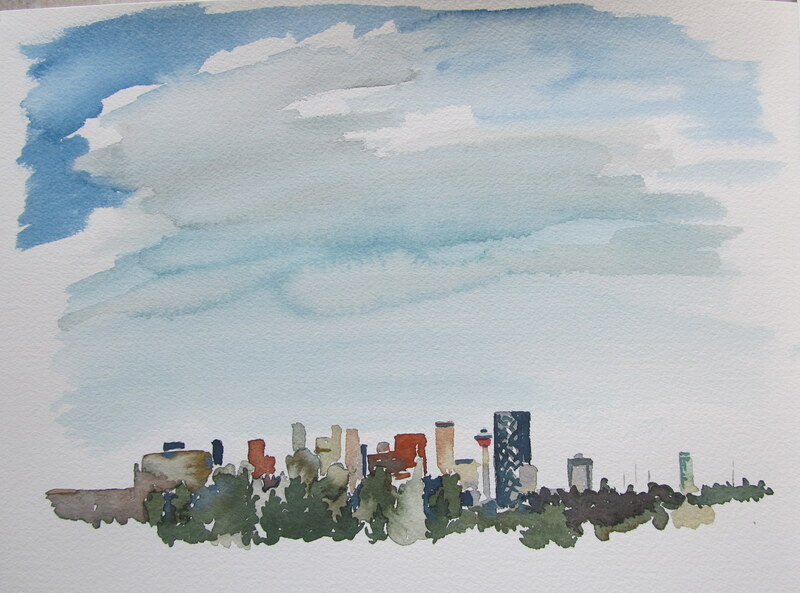 Watercolour Wednesday — Calgary Skyline. Over the weekend my husband, daughter and I went to the park by our house. It was gorgeous weather and perfect for a little bit of painting (this was the day before the insane windstorm). Even with the unseasonably warm weather, my fingers were a bit numb by the time we headed home. 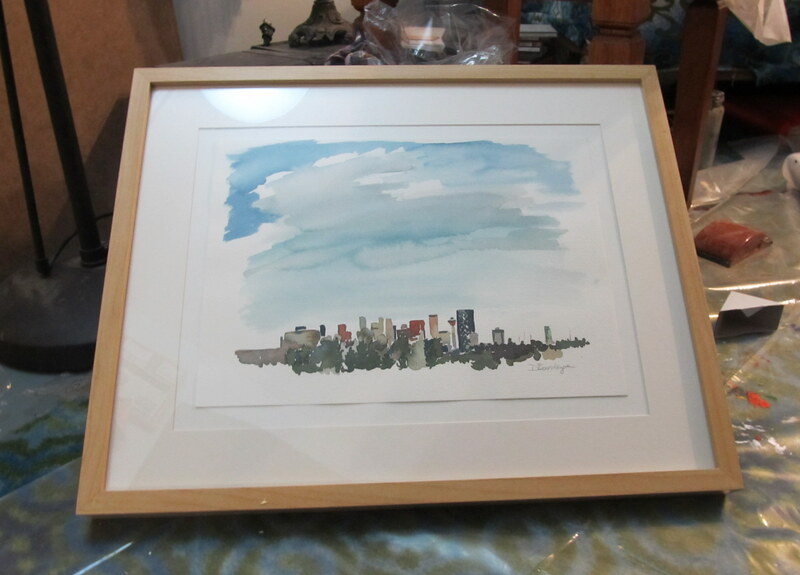 I was thinking about donating this one to the silent auction at work that is raising money for Inn From the Cold (a charity organization here in Calgary). I framed it up all pretty! It’s just an Ikea frame, but I find that they work really well for watercolours. I also did this same view back in April as my first “getting back into watercolours” painting and now looking back at that one makes the new one look stilted and boring. The one I did back in April was done in my sketch book, so it was on regular paper and the paper rippled up rather a lot, but it has quite a different quality to it. And although they were done in very different weather conditions and I have learned a lot about watercolour since then, I think I still prefer the earlier one. 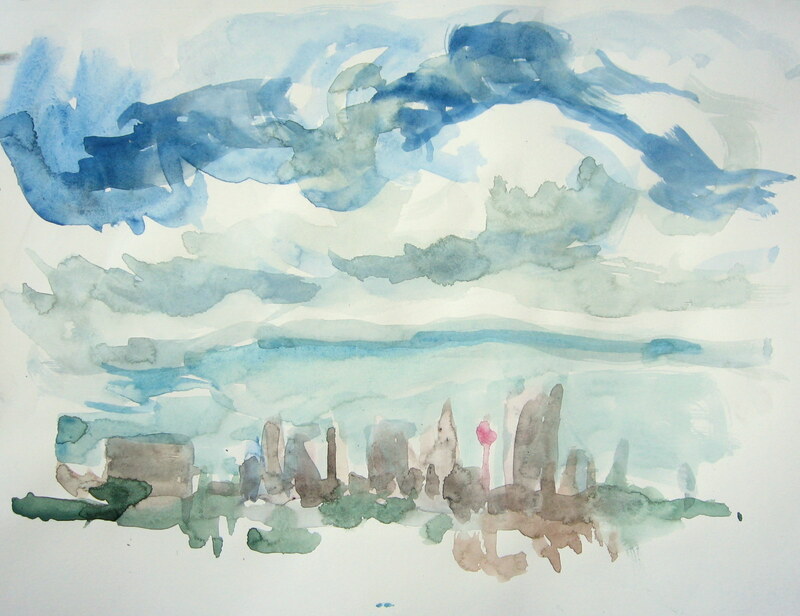 Maybe I should go back to non-watercolour paper sometimes to keep the painting loose or maybe I’ll just have to paint this view on a crazy windy day again sometime. Or maybe I just need a week to look at the new one and come to terms with it. ← It was my first parent-teacher interview on Friday. I kind of get the feeling I failed. I love love the new one. I Love the details in it. Thanks Lindsey! I am liking it more and more. This is a really nice painting you did Dayna, I like the frame you chose for it and can’t wait to see it up close! Thanks Marie! I took it in to work yesterday for the auction. Now I get to be nervous for the next 4 days. love it! Somebody got an awesome deal.